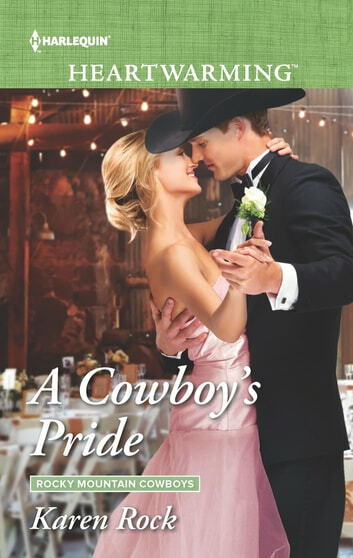 A COWBOY’S PRIDE by Karen Rock Once again Karen Rock has delivered us an emotionally charged, page turning chapter in the Rocky Mountain Cowboys series. She has us seeing the Loveland – Cade feud from both sides making it extremely hard to decide on which side of the fence to hang on. Through the pages of A COWBOY’S PRIDE, we explore how the feud originated and how love, family and perseverance come through with details to explain it all and possibly a resolution to bring both families together as one. A COWBOY’S PRIDE is a story of finding resolve to past grudges, finding peace with one’s past and present and of second chance love. Karen Rock does all this within the pages of the book with great skill that has you visually seeing the story as you read it, understanding how both Cole and Katie-Lynn feel and pulling for more than one marriage to take place. Katlynn Brennon, originally called Katie-Lynn, must return to her hometown – Carbondale, Colorado – to find an extraordinary story to save her show, Scandalous History, from being cancelled. Cancellation of the show would end not only her job, but also leave her once again doubting her purpose or importance in life. She would be a nobody, an unknown again. Would the Loveland – Cade feud be the ticket? Could she survive being in the same town with her ex-fiancee? Back to her hometown, she finds herself not only in the same town but teamed up with her first and only love, Cole Loveland. The feeling she had for him have not faded with age as it seems he’s hadn’t either. As she gets comfortable in her skin again and who she is without all the makeup and hype, she also realizes that the feelings she had about her family and her unimportance were inaccurate and leaves her doubting her choices in life. Could here be hope for a rekindled relationship? Could they each give and take this time round or would it just be a repeat of the past? This book handles it all with page turning emotional excitement that will have you laughing, crying, hooting and hollering, getting angry, feeling goosebumps and smiling. Even though this is the 4th book in the Rocky Mountain Cowboys series, it can definitely be read as a standalone. I will say, once you read it you will be running to get the other books in the series and looking with great anticipation to the next installment in the series. I highly recommend this book to anyone that loves a great love story, a book about cowboys with true grit and integrity of family, a story with mystery and intrigue. 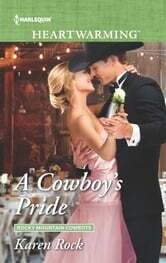 In other words, if you are looking for a GREAT BOOK, look no further than A COWBOY’S PRIDE by Karen Rock. This one is an intriguing read with so many layers. The past and present interwoven with many similarities, including hardheaded Loveland males, Cade women who find themselves in tough spots, generations-misunderstandings, heartbreak and love. This is another fun addition to the Rocky Mountain Cowboys series. Karen Rock does a great job capturing life and love against a Colorado backdrop. *ARC provided in exchange for an honest review. The start of the Loveland side of the story! 4 1/2 STARS! Old feelings and old mysteries collide as two childhood sweethearts reunite and band together to learn the truth about his family history. Discoveries they never expected lead them down a path of danger and insight. Can Cole truly trust her to do what's best for his family, or will her ambition win out against her feelings for him yet again? Delving deeper into the Loveland side of this feud lets us get to know the family better since the series so far had centered around the Cade's. I enjoyed how well the Cades were still brought into the storyline of this family as well. An enjoyable plot, great characters and a satisfying mystery kept me enthralled throughout! Katlynn Brennon left Carbondale, Colorado a dozen years ago ... naive, broken-hearted and living only for her dreams. Now, after achieving great success, she's on the verge of having her TV show cancelled and struggling to keep it all together. She never thought she'd be returning home to Carbondale, but when the infamous Cade-Loveland feud strikes the fancy of her producers as the great mystery that might save their show, she finds herself smack dab in the middle of her old life again. Cole Loveland already feels like Katie-Lynn did him wrong by choosing her career over their future together all those years ago, and now here she comes waltzing back into town determined to stir up an ugly past that his family just might not live down. He'll do anything to keep his family secure ... even agree to work with her to solve the mystery of the start of the big feud between the Cade's and his ancestors. Fighting the feelings that still fly when they're in the same vicinity might be a tough road to travel though!